With emerging numbers of startup companies and traveling professionals in Malaysia, coworking spaces begin mushrooming as well. Decorated tastefully with either simple or sophisticated designs, one can certainly feel a different air when working in such spaces. The amount of flexibility to move about, talk to someone new or even to just bounce of ideas with coworking colleagues does make your working world a smaller place. From hipsters to smartly suited professionals, coworking spaces around the city are becoming the talk of a new trend to start lean. 1. Incube8 – Boasting with basically everything an entrepreneur or business professional need, this shared office space is equipped with more than basic setups. Choose from day offices (RM 49 daily), virtual offices (RM 179 monthly), hot desking (Unknown price), shared office spaces (RM 250 monthly) or even a designated space area (RM 1,488 monthly) for your company only, it runs 24/7 with free flow of coffee & tea for those that might need to burn the midnight oil at work. Somehow, this space even comes with conference rooms (with video conference facilities), business lounges and amazingly company secretarial services. Part of the service provided is also business call answering services that might be valuable if you are never much around. 2. Startup Hub @ Sunway Mentari & Cyberjaya – Similarly, this coworking space offers pretty decent use of space and facilities like training room, high speed internet access, meeting spaces, and prayer room. One thing missing is perhaps the elegant looks that most other coworking spaces might have. 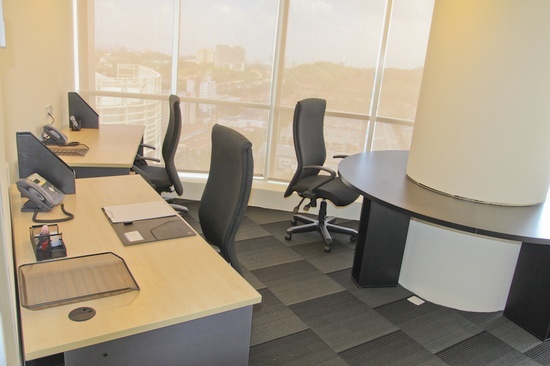 You can choose from a Permanent Desk (1 table + 2 chairs) which allows entry to Startup Hub @ Sunway Mentari or Flexible Desk (1 table + 2 chairs) which allows entry to both Startup Hub @ Sunway Mentari & Cyberjaya. An interesting fact about this place is that it occasionally offers entrepreneurial workshops that coworkers of this space can participate for free. Space prices are subjective. 3. Nook – is a coworking space but not just another rent-a-desk kind of place. They would like to call it a progressive coworking space with a casual café-like feel, that offers all of the ‘hardware’ you need to run your business. These include high-speed Internet access, mailbox and facsimile services as well as facilities for conferences and events. Nook wants to make sure that your needs on the ‘software’ side are also covered. Nook is an open plan space located atop a hill, overlooking lush green surroundings – the perfect setting for collaboration, creativity and all the other things you need to get your mojo going (including free flow of coffee and tea). You can choose different packages it offers such as virtual office (RM 80 monthly), 10-day pass (RM 500 monthly), Daily drop-in (RM 60 daily) or be a permanent resident (RM 700 monthly). 4. Whitespace International – Not as the name suggests, this coworking space does have many other colors too. It incorporates interior designs that feature neo-modernist chic designs that are splashed in white with glass textured whiteboards. All spaces are WiFi and tele-conference enabled and offer a professional environment for client meetings and discussions. Located at 3 different areas namely Bangsar, Puchong and Mont Kiara, it surely does not lack the facilities required by most coworkers. Facilities such as business address, dedicated phone & fax number, access card, call attendant, document photocopier, scanner and fax, courier & dispatch services does really attract anyone. But one thing we didn’t see highlighted is a pantry that would completely compliment this space. These posh looking spaces are offered in 3 packages ranging from RM 139, 239 and 339 though. Pick your selection. 5. PAPER + TOAST – a coworking space and kitchen collective. In keeping with it’s core beliefs of having spaces within space, flexibility is preserved throughout the outlet as well as its services. By taking the best elements of a coworking space (productive, functional) and the best elements of a coffee shop (social, energetic, creative) we combine them to give individuals the chance to have their own, affordable space to work, meet and eat. It has meeting spaces, virtual office systems, cafe of course (free flow coffee & tea), high speed broadband and somewhat one of the most elegant spaces around in Kuala Lumpur. It comes with a specially customized rate such as usage of an individual desk at RM 8.50 per hour, RM 3o per day, RM 600 per month, and RM 300 for 12-days pass. Their facilities comes also with a certain fair price and accessible with a minimum of 3 pax per room. 6. Fluent Space – termed as a coworking space for independents, freelancers and small teams in Petaling Jaya, this space really offers cosy yet modern look at the same time. Essentially furnished with simplicity, it allows one to stay and admire the openness it has (one look to the end of the hall). Fluent Space plans to do more than create a space where strangers come to work, but rather develop a community environment where independent creative-type folks – developers, designers, multimedia industry people – gather to help each other out. Coffee & Tea is also served by machines free of charge. The packages offered are your permanent desk (RM 600 monthly), daily pass (RM 40 daily) and 10-day pass (unknown). 7. The Nest – Based in the lush hills of Damansara Heights, The Nest is spread across three floors and a beautiful garden. Always filled with many amazing entrepreneurs, the spirit of fearlessness and collaboration at this hub for start-ups makes it a dynamic place to build your ideas! Often hosting Malaysia’s key start-up communities and events, The Nest is an extremely casual, high energy space that operates 24/7. From meeting rooms to photo studio to a fully operational kitchen; it even has showers, laundry and bean bags for those long overnighters. During down time you can chill out at the PlayStation 4 lounge over a game of FIFA14 or take a dip in the swimming pool in the backyard to recharge. To ignite your passion, choose from hot-desking (RM40/day or RM400/month) or private offices (starting from RM1600/month). 8. Urban Village – is a bungalow uniquely spotted among the residence of Bangsar that offers coworking space on 2 floors. It is a creative hub that provides facilities for creative entrepreneurs and professional freelancers to operate their business. Urban Village aims to help as many young creative Malaysian entrepreneurs as they can, in providing them with basic business necessities such as work space, event space, retail space, entrepreneurship consultation and exposure. With spaces for rent such as a 725 sqft event area (RM 500 per day), training room (RM 300 per day), studio room (RM 1,200 per month) & flea market space (outdoors – for RM 500 per day). Free Internet, a cafe to quench thirst and prayer room included. Rates for the coworking spaces on a permanent basis (RM 800 monthly for 6 months contract), 7-days per month usage (RM 200) and 14-days per month usage (RM 400). Updated: Urban Village is closing down. Till we get to know where they are shifting to. 9. Makespace – is a collaborative working space located at SStwoMall for people who bring to life new ideas, products, services, or social projects. It focuses on coworkers from new social enterprises to robots and figuring out new ways to up cycle recyclables. Get workbenches, access to maker equipment like 3D printers and a variety of materials. Being relatively new but already having a cool space with spiral staircases to an attic space, this is surely a coworking space to look out for. Makespace can be utilized with various packages such as hot desks (RM 30 per day or RM 300 monthly) or a permanent desk (RM 600 monthly + free storage space). Unfortunately, there isn’t any special cafe to boast but just simply a coffee maker somewhere around the space for general use. Thank goodness, lots of eateries around to compensate that loss. So whenever you are around in Kuala Lumpur, do check these coworking spaces. Your professional travels can now be more than just Starbucks.